We have a project which is under construction in Midtown Manhattan located near the top floor of the building that has a 180 degree panorama. The client loves this view and decided to keep it but make his apartment larger by making it into a duplex instead of moving somewhere else. He waited until the apartment above was for sale and available to buy. A big opening was made in the concrete floor and a new stair case will be inserted to connect the two floors. 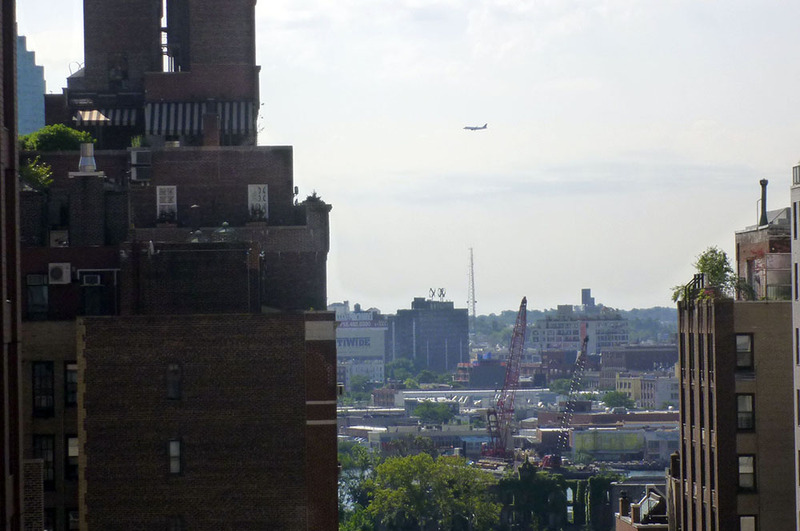 From his apartment you can see the woods of the United Nations grounds, the East River, Roosevelt Island and Long Island. It is understandable why he wants to keep living here. In a previous post we wrote that many people enjoy outdoor life on their roofs. The photos that we showed were all looking up from the street, but now we can see the terraces at the same level. 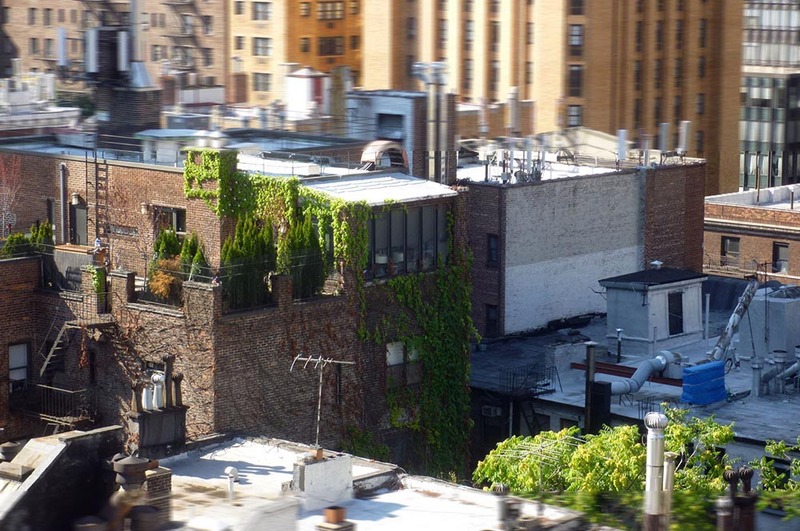 For his close view you see so many roof terraces with many plants. The neighborhood is almost all residential even in this commercial area. The old zoning regulated the height of the buildings and dictated their shape which required set backs to allow light into the streets, ending up with a lot of setbacks. Terraces were a lucky byproduct of that setback. The current zoning regulations no longer lead to this. 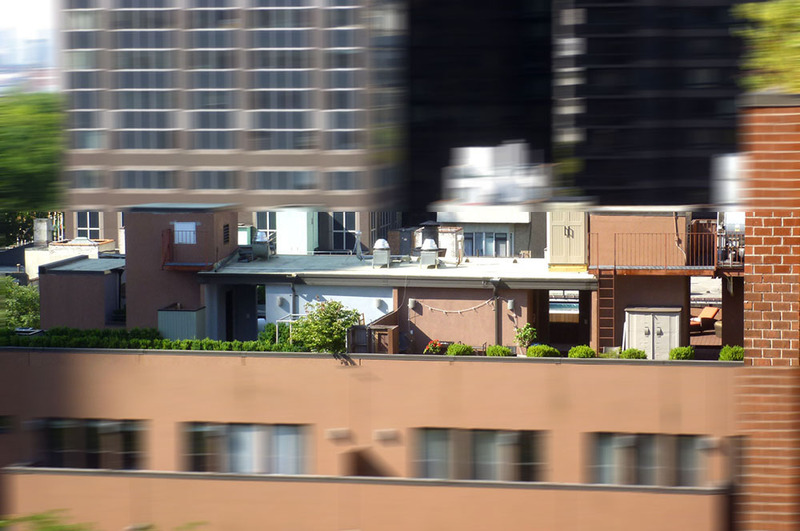 Mid Manhattan is getting taller and taller, filled with straight-up extruded high-rises. 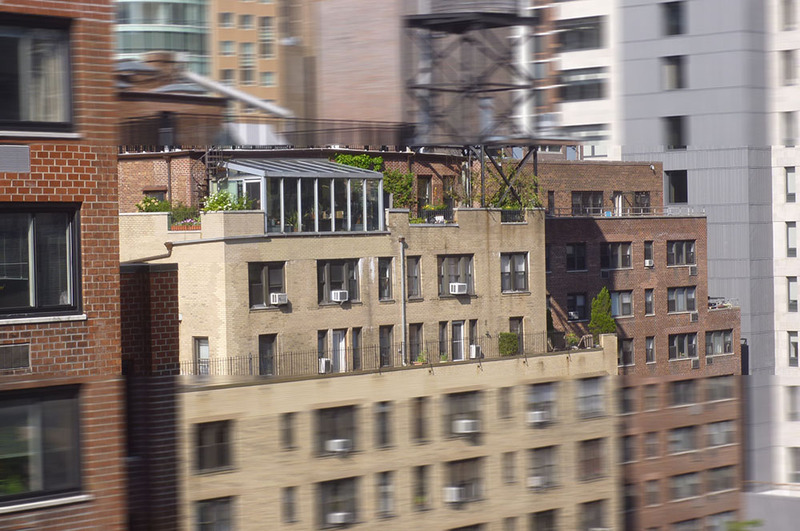 Terraces are disappearing and roof tops are no longer habitable instead filled with tons of air-conditioning machines. Someday in the future this area may be packed with super high-rises and setback terraces with trees may extinct; they were a by product. Now almost every street is narrowed by on going construction of high-rises, creating traffic congestion. We found a building which has a big trees downtown where we have another project. They look to be more than 10m tall when you compare them with the steel handrails which are around 1 m high. The trunks seems to be 30 cm in diameter. How did they grow there? The pots must be huge and heavy. How can the roof structure hold it? How strong is the wind pressure on the trees at this height? How are they prevented from falling?….. It is beyond our imagination. In Hong Kong last spring, there was a near-disaster when a university building whose roof collapsed because the “greening” with a plant cover overstretched the designed weight load. Nobody died, fortunately, but the incident has put a real constraint on owners and developers interested urban roof farms and green cover. 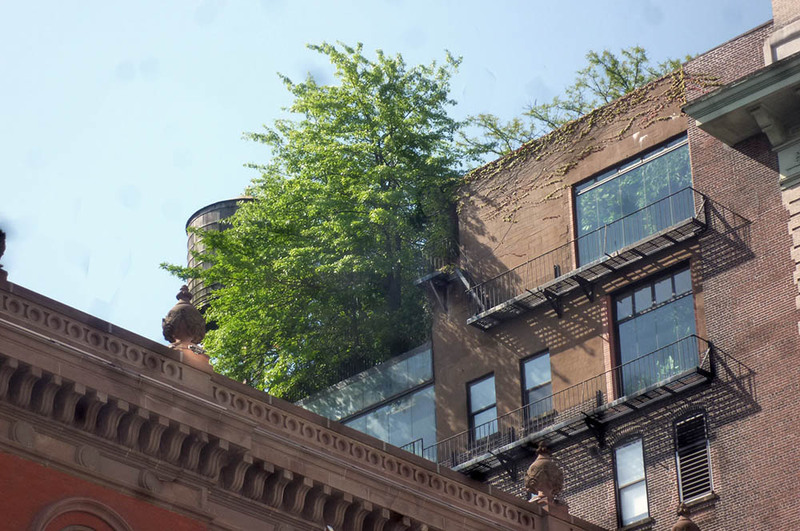 These should be designed into new buildings where the weight loads can be calibrated and controlled — but then that somehow misses the point for many owners for whom a garden in the sky is a toast to the imagination.